You wouldn't be doing your job in Paris if you didn't go and eat at least one thing that's completely pretentious. But it wouldn't really be particularly authentic if you passed up the chance for falafel on the street. Go, go, go to L'As du Fallafel. 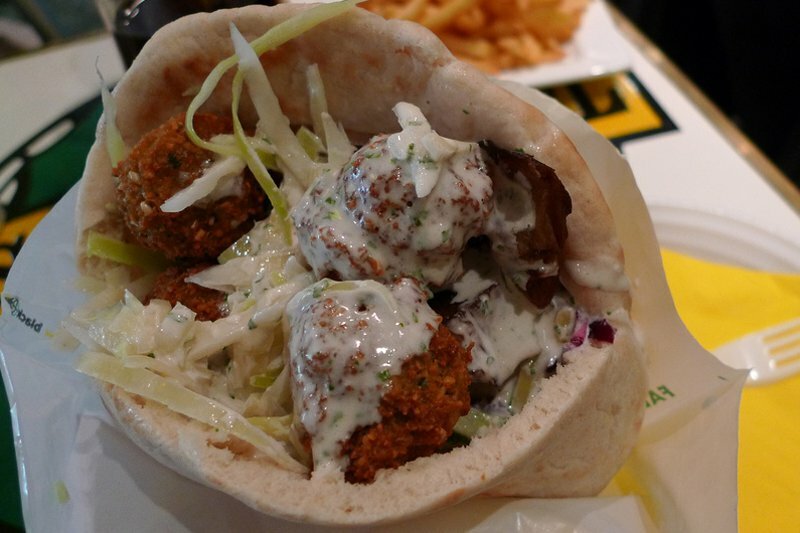 France is a delicious outpost of North African food, and as a descendent of Jewish French North Africans, I feel qualified to command you to go to Le Marais, the old Jewish quarter, in search of this falafel shop. It's not undiscovered, but it's cheap, hectic, and buzzing with big personalities. Order the falafel or merguez pita; get whatever you want tucked in there — a perfect concoction of crisp chickpea fritters, garlicky oil, creamy tahini, salted cucumber — then add too much harissa and chermoula for your own good. It's messy and delicious and a welcome break from the delicacy of Parisian galettes and dry champagne and proper etiquette. I like to go with my best friend from culinary school. We get tahini all over our faces and burn our tongues with spicy sauces. After a few flirtatious French language errors with the handsome waiters, and many napkins, we are ready to explore. With plenty of euros left over. Of course we are stuffed, and you will be, too. But that shouldn't stop you from walking down the rue de Rosiers to see the famous Jewish Parisian bakeshops and pick up a real French bagel (stuffed with cream cheese, lettuce, and cucumber). Consider it a digestif.